This three-part video series was produced in 1994 at a time when the future of the salmon was dire. Columbia River Basin salmon returns were from five to ten percent of their historical size. The series explains that if this magnificent resource is to be truly restored, the region’s land, water, and fish resource decision-makers must cooperate in an unprecedented level of education, communication, participation, and coordination. Our capability to reach this level depends on our ability to understand each other’s cultures, traditions, needs, and concerns. 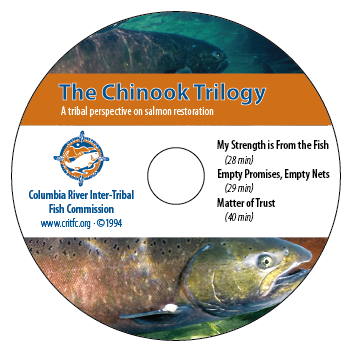 To educate regional resource personnel and others about tribal culture, treaty rights, and the tribes’ plan for salmon restoration, the Nez Perce Tribe, the Confederated Tribes of the Umatilla Indian Reservation, the Confederated Tribes of the Warm Springs Reservation of Oregon, and the Confederated Tribes and Bands of the Yakama Nation produced the Chinook Trilogy, a critically acclaimed video series. The trilogy consists of three 30-minute episodes. Click on a title to watch the entire episode on YouTube. The first episode in the series, My Strength Is From the Fish, contains evocative scenes and interviews with tribal elders and members, revealing that the culture and spirituality of the four Columbia River treaty tribes is inextricably tied to the water, that is the support to all life, and to the salmon. The second video, Empty Promises, Empty Nets, examines the treaties, landmark legal cases and judgements that confirmed fishing rights of Columbia River tribes. Historical footage and interviews with Federal Judge Robert Belloni and others directly involved in these decisions define the legal foundation on which Columbia River salmon survival may well depend. The final video in the series, Matter of Trust, describes the biological and political strategies the tribes propose to overcome nearly 150 years of river development, habitat destruction and ineffective regional and federal salmon management. In addition to offering the Trilogy on YouTube, it is also available on a single DVD. The DVD is $20 and comes with a booklet with an historical chronology, maps, and charts. See ordering information to the right.